DUBLIN CITY COUNCIL has announced it will extend the 30 km/hr speed limit in the city to more residential areas from Wednesday morning. The expansion will come into effect from midnight Tuesday 30 May. Councillors voted on the expansion into residential areas in December, with 37 votes in favour, eight against and two abstentions. The phase one expansion in the city was introduced on 1 April in certain residential areas and in the vicinity of schools in areas of Dublin boarded by the Canals. A public consultation on the issue of speed limits was launched by Dublin City Council last July. The council received 550 submissions on the matter. One hundred of those supported the expansion of the lower speed limits. The speed on busy, arterial roads will not be reduced during phase two, however it is due to be reviewed as part of phase three, expected in 2018. 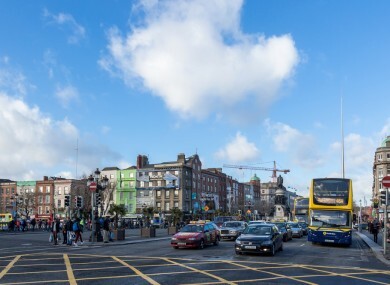 Speaking after the vote was passed in March, Green Party councillor Ciaran Cuffe said all the evidence pointed to the measure making the streets of the capital safer. The councillor also said the change will ease parents’ worries about their children walking in these areas. Road signs will now be changed to reflect the new, lower speed limit and “where budgets allow”, the council will make changes to the roads. Simply changing the road signs does work – you get a significant change. Andy Walsh, senior engineer at Dublin City Council, told Morning Ireland today that the limits would apply to areas “bounded by the Canal to the north and south, the south circular road and Ringsend”. Walsh said the council was working closely with the Road Safety Authority, local residents and other parties in terms of education and enforcement of the new laws. Everything is done on an “evidence-basis”, Walsh said. We are confident that this will save lives. This is purely about road safety. This will help us to create calmer, safer communities. Speaking at the announcement of today’s expanded 30km zone was Roseann Brennan whose son Jake died in a road traffic accident at their estate in 2014. She said: “To all road users I want people to be aware that no one wants to live with regret in their lives due to a small mistake that could easily have been avoided. The 30km/hr speed limit expansion makes so much sense. Just stop and think before you get into your car and drive, especially in residential areas. Email “These areas will have the speed limits on their roads reduced to 30km/hr this week”. Feedback on “These areas will have the speed limits on their roads reduced to 30km/hr this week”.